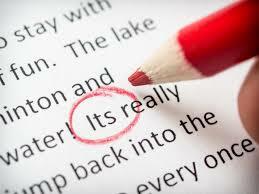 Top 10 Errors in English Grammar You May Make a Mistake In! In English, one of the commonly confused and misused aspects in ‘spelling,’ and if you were one of those finding it hard to determine the difference between two or more words, especially when used in a sentence, then you may look into this quiz and answer it! I will miss some of my friends, who cannot watch the football game in the stadium tonight. I wonder why ____ not interested to watch it knowing they are all a fan like I am. The librarian asked them to keep quiet because some students ______ to concentrate for the coming mid terms. They don’t have a lot of ____ to show during the interpolation. Consequently, they lost in the debate. Everyone ____ the right to freedom of speech, but none is permitted to overdo and abuse their right to speak to ruin someone’s reputation on social media. She walked ____ to avoid her motErrors in English Grammarher from catching her going home late last night. They were talking about Andy when he _____. Unfortunately, he heard everything they said about him for they thought no one could her them. “____ pet dog ruined my garden,” he said in a convictive angry manner that made her cry. She ____ take her vacation next month, so she is trying to finish her papers up before their deadline. _____ post offices around this place, but they’re not open on Sundays. I have to wait until next Monday to mail these documents to school. They ____ planning to go to Paris this year since June, but their tight schedules make them postpone the plan every time. Okay, instead of wallowing of the problem on grammar, put your head up and learn how to correct errors in English grammar by answering the quiz that follows. As you know, there is always a room for improvement and that it’s not right to feel alone on this matter because there is help out there! To improve your skills, come on and start with this quiz to find out what your common errors, and possibly your weaknesses, in the English grammar world. If ready, come and let’s start! Wow, that was awesome! You did a good job, although you still have to practice to learn and improve your English grammar skills more and eventually be good in correcting grammar and punctuation errors yourself. Finally, feel free sharing this quiz with friends and help them enhance their grammar, too.